Ice berg lettuce came almost exclusively from Spain. Only in Frankfurt were there Turkish products, which were placed at €6 per 10-pack. More new loads and a demand that could not keep up with this resulted in the lowering of prices, sometimes quite considerably. Nevertheless, marketing did not always succeed. A different trend was observable for lettuce: the dominating Belgian supply became more expensive due to a good demand. As a result of this, prices of complementary Italian and local batches increased as well. Meanwhile, in Hamburg, German products lost in importance because their quality was not totally convincing. Italian supply dominated with regard to colorful lettuce. There was more inflow from France as well. Regional suppliers tried to complete this, but with rather small quantities. Prices developed differently: in Munich they went up, but in Frankfurt and Cologne they tended to drop, due to increased supply. Although Italian endives were being marketed continuously, they were usually cheaper. 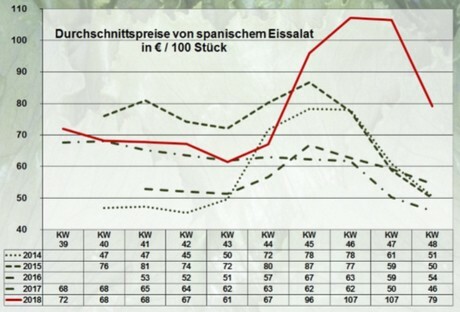 Lam's lettuce generated more demand in Frankfurt than before, which had little effect on prices however. In Hamburg, too, they remained stable, based on the availability. Germany dominated events with the Elstar, Jonagold, Boskoop and Braeburn. Organoleptic properties sometimes left something to be desired. The supply of Dutch Boskoop, Elstar and Jonagold intensified. Italy determined the sales, as in the previous weeks, with the Abate Fetel, Santa Maria and Williams Christ. Dutch Gute Luise as well as native Alexander Lucas, Conference and Novembra complemented things. The presence of European fruits dropped. The quality was not completely convincing and demand seemed to shift to imports from overseas. Spanish Navelina characterized events. In general, sales were a little livelier the pre-Christmas week than before, also because of the autumnal weather, but it was not consistently satisfying. Spain dominated the segment of clementines and further increased its supply. St. Nicholas Day is approaching, which drove up the sales. And then there was the autumnal weather, which added to an increased demand. Prices often remained constant. Spanish Primofiori dominated the events, followed by the Turkish Enterdonato. A trade without particular highlights characterized the 48th KW. Demand could be met easily. Since the inflow from the ripeners was well adjusted to the steady sales, prices generally remained at last week's levels. Italian, French and Belgian supplies expanded. With the first Spanish and Greek batches, the assortment grew. Meanwhile, the importance of German products dropped. Ice berg lettuce came almost exclusively from Spain. Extensive batches saw a demand that could not keep up, resulting in lower prices. These were sometimes quite pronounced. A Spanish influx dominated, followed by Greek produce. Availability was so abundant that it surpassed demand. The marketers were then forced to reduce their prices. As before, Spain, the Netherlands, Belgium and Italy formed the basis of the assortment. Morocco participated primarily with round tomatoes. The batches from Spain dominated the business, even expanding their dominance. In general, demand could be met easily. The prices hardly moved.